Michael McFadyen's Scuba Diving - Green Point One of Sydney's most popular, but also most ridiculed, dive sites is Camp Cove. Located on the southern shore of Sydney Harbour, Camp Cove is actually two dive sites that can can have extremely good or very awful conditions, mostly dependent upon the prevailing weather. Protected from all but cyclonic northern swells, the sites are especially suited when southerly winds are blowing and the seas are too big elsewhere. One drawback with these sites is that because they are located in the Harbour, after periods of rain the visibility can drop to only one to two metres. Average visibility is in the order of four to five metres but I have encountered 9 to 12 metres a few times. Despite these comments, even in two or three metre visibility you can have a fantastic dive. You get to Camp Cove by following New South Head Road from the city or Old South Head Road from the southern or eastern suburbs. Once you get to Watsons Bay, go past the Watsons Bay Hotel into Short Street (follow the Camp Cove sign). There are basically two dives that you can do here. The first dive (covered in this page) starts from the south-western (city) end of the beach and is generally known as Green Point. Access to this dive is by parking in the small car park at the end of Pacific Street, which is the first on your left when you enter Short Street. The second and more popular dive is the northern end of the beach and is the dive site commonly called Camp Cove. If there is no parking at Pacific Street, there is another bigger (but still very small) car park located in Cliff Street, found by following Short Street and the one way streets. If you park here, you will need to follow the directions later in the article. 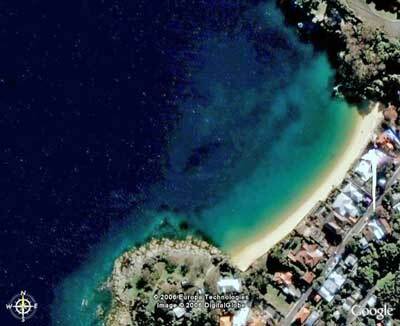 Parking spots are at a premium in the entire Watsons Bay and Camp Cove areas, especially in summer. If you do dive here on a summer weekend arrive very early and do not even consider parking illegally as you are almost certain to get booked. Even late in the afternoon in Summer can mean trouble finding parking. 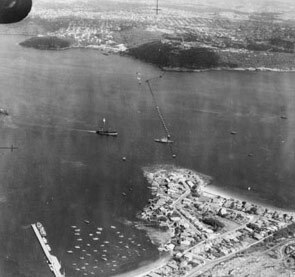 During World War II, Green Point was the site of the southern end of the submarine net that stretched across Sydney Harbour. You can see it in the photograph above right. After parking in the car park, gear up and walk the short distance down the street to the water's edge. The map at left is of the Camp Cove main dive site. Green Point is around the point on the left. If you start at the northern end of the beach, either walk to the southern end or start from the northern end, swimming via the small off-shore reef to the south till you come to its end. Then cross to the headland. Repeat this at the end. The dive site at Green Point consists of reef running from the shore that goes right around the Gree Point headland. Enter the water off the beach and put on you fins. Drop straight to the bottom and start following the reef edge. The depth on the sand starts at three to four metres and gradually drops away. After about 20 metres or so, there are some quite large overhangs or even caves. These are a little off the edge and the depth is 2.5 to 3 metres. There are a lot of fish in this area, luderick, seapike and yellowtail. There are even some blackfish in the overhangs. Back on the sand, the depth drops to six to seven metres. There are some small rocks off the reef and further on a large structure that I have not yet figured out. After about 15 minutes you will see some larger boulders away from the reef edge. In better visibility (say seven metres), you will see these boulders and it is easy to navigate from one to the other. In the shallows here I have seen a huge two metre long jewfish. The depth drops dramatically here. It is easy to get to 15 or even 19 metres. This dive goes for a long way, as you can either keep jumping from boulder to boulder or follow the reef edge. On the boulders and reef, edge, check out the kelp for sea horses. Although they are not prolific, you may see one every few dives here. Once you have decided to turn around (it is unlikely to be because you are low on air), you can follow the same track back or go across to the reef edge and follow it back. You should easy get a 50 to 60 minute dive. A thing that must be remembered here is that you should never, repeat never, ascend from the reef, even if you have lost your buddy. In summer, and at other times, there are all sorts of boats anchoring and manoeuvring off the beach and around the point. Unfortunately, due to the nature of the persons (less kind writers would call them yuppie idiots), a lot have little regard for divers or the environment as you will discover from the huge amount of rubbish, mostly champagne and wine bottles, that they sometimes throw into the water. If you are lucky you might even find valuables lost overboard. Apart from sea horses, bottles and sunglasses, fish you may see here include velvetfish, smooth flutemouth, old wife, fan-bellied leatherjacket, blue-ringed octopus, cuttlefish, pipe fish, blue swimmer crab, eastern kelpfish, combfish, senator wrasse, sawtail surgeonfish, mulloway, moon wrasse, flounder, eastern fortesque and blue groper. This is also an excellent night dive, one of the best in Sydney and extremely safe even for novice nightdivers. Just do the same dive as described above.